Thank You Sean. Our Chauffeurs are the best. So glad you enjoyed the Trolley. It truly is a unique experience. Our Executive Shuttle Buses sure make for a comfortable, safe way to transport your guests. Congratulations and Thank You for choosing Shore Luxury Limos. 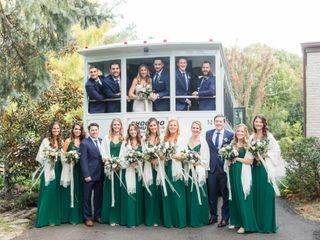 Beautiful 34 Passenger White Trolley for Wedding! Thank You Kelly for your review as well as posting a few pictures. Anthony was your Chauffeur. As Mike explained to you we just put the 34 Passenger Trolley into the fleet and luckily was still available. We are very proud of our team of seasoned Wedding Chauffeurs and support staff. Many Years of health and happiness. For the price this company can't be beat! Researched for months and this is the company to go with. The driver was amazing, the company was great with everything and I could not be happier with their services!!!!!! Thank You for your kind words Shannon. We are very proud of our staff and Wedding Chauffeurs. Congratulations ! Mike was so great to work with! He got us out of a small bind and made everything work for our wedding. We are so grateful! Thank you! It was a perfect day. Thank you for the kind words Natasha. I am so proud of our staff and Wedding Chauffeurs. Glad everything worked out. Congratulations ! Shore Luxury Limo was so responsive leading up to the big day. We had a few changes needed to accommodate more passengers and Mike was super helpful throughout the process. The day of the team was professional and on time as well. Our guests were impressed with the vehicles as well. Thank You for your nice review Kerri. We are so proud of our team. Congratulations and a lifetime of happiness. Thank You for your review MJ. We are so proud of our staff and Chauffeurs. Congratulations and Best of Luck ! 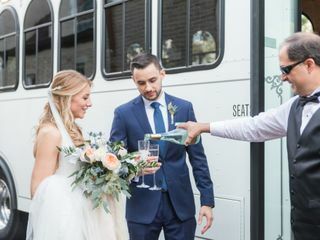 Dear Mike Grieco, Thank you for taking time to help us get the right amount of vehicles and trips for our daughter's wedding on 6/23/18. Your trolley driver, Anthony, and bus driver, Namir, were amazing! Anthony was so good to and for the wedding party, all saying how nice he was. The bus driver was very courteous to everyone. It was worth it to keep our guests safe by supplying the transportation. We had over 50 people to move from the Holiday Inn Mainland in Manahawkin to the the Surf City Yacht Club. Everyone enjoyed the wedding without worrying about driving! We definitely recommend Shore Luxury Limos to take care of your transportation needs. Thank You Amanda for your review. Weddings are so special to us and our team. Congratulations again and Thank You for choosing Shore Luxury Limos. Great experience. 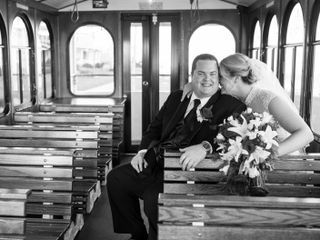 My wedding was on 11/11/17 and the limo was prompt, the driver experienced, and the infinity limo was beautiful. Wish my venue wasnt so close, i would have loved to spend more time cruising around. So glad I went with Shore Luxury. Thanks. Beautiful limo, friendly company to work with, and a good value! Thank You Bryan for the nice review. Thank You Scott for the nice review. Mike had a blast hanging with you, your family and friends. 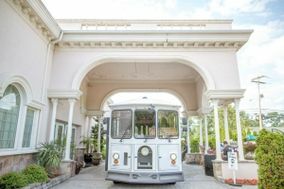 This was a very cool venue to showcase our White Wedding Trolley. Thank You Ray for your kind words. 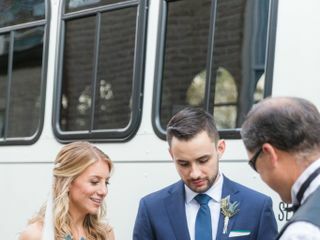 Our Wedding Chauffeurs realize the importance of getting everything perfect. Mike provided wonderful service for my daughters wedding on short notice. The girls and I had a great time riding in grand style in the white trolley on this special occasion. Your willingness to make my daughters day special with the trolley and the service you provided are to be commended. 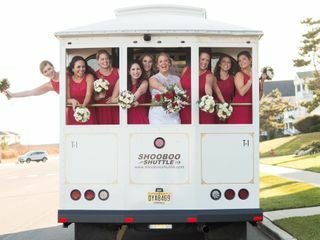 Shore limos was great to work with! We had a date and a venue change and Mike and his team accommodated us no problem! They were even able to ad on needed services last minute, which was much appreciated. On the day of the wedding all vehicles were clean and the drivers were on time, professional drove well. Will will definitely use them again going forward! DO NOT USE THIS LIMO COMPANY FOR YOUR WEDDING! Their vehicle broke down in the church parking lot, we were told we couldn’t stop for pictures that we had agreed to pay extra to do. The driver told us to close the windows and couldn’t use the air (in June) bc it was over heating. We were stuck on the side of the road multiple times trying to get to the wedding. What an AWFUL experience! Please save yourself the trouble. I understood that it was not their fault we broke down and even though I was very upset we couldn’t stop for pictures on our wedding day I called the company nicely to explain what happened and ask for a refund. They only wanted to refund $200 for the awful experience and were EXTREMLY nasty to me!...... please save yourself the trouble and disappointment and find a different company! If I could give this company no stars I would!